Photo: Nick Rahaim. Creative Commons BY-NC-SA (cropped). 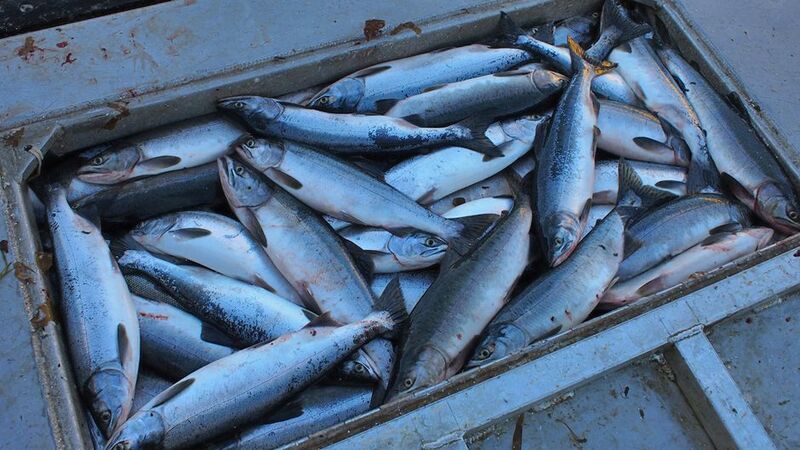 Pink salmon — the smallest and most abundant of the Pacific salmon species, and a supper table mainstay in many parts of the world — may be swimming towards trouble. And they are not the only dish likely to disappear from the menu. Mussels, oysters, clam and scallop could all become scarcer and more expensive as the seas become more acid. And as the world’s waters warm, fish will start to migrate away from their normal grounds at an ever-increasing rate. New research shows that as the world’s waters acidify because of carbon dioxide levels in the atmosphere, the pink salmon (Oncorhynchus gorbuscha) could become smaller and less likely to survive. Previous studies have repeatedly and consistently explored potentially problematic consequences of change in the pH value of the world’s oceans. The higher the carbon dioxide concentrations in the air as a consequence of the burning of fossil fuels, the greater the change in oceanic acidity levels. But researchers at the University of British Columbia, Vancouver, and colleagues looked at the special problems of freshwater fish. Only about 0.8% of the world’s water is fresh — that is, found in lakes and rivers — but freshwater species represent 40% of all fishes. Salmon spawn and the young are reared in fresh water, before taking to the seas to mature, then returning to repeat the cycle. The Vancouver scientists report in Nature Climate Change that they tested very young embryos in water at acidity levels expected at the end of this century, and observed them for 10 weeks. They found that these laboratory-reared salmon were smaller, and their ability to smell was reduced, which could mean problems in returning to their spawning grounds or for scenting danger and responding to it. It is not too late for society to benefit greatly from immediate reductions in CO2 emissions. At the age of seaward migration, they were less able to use oxygen in their muscles, which promised problems finding food, evading predators or making long journeys. Salmon aren’t the only freshwater fish at risk from climate change. Research published in the journal Environmental Toxicology and Chemistry reveals that a rise in water temperatures of 5°C could make common pesticides and industrial contaminants ever more toxic. Ronald Patra, an environmental scientist at the Department of Planning and Environment in New South Wales, Australia, and colleagues tested rainbow trout, silver perch, rainbowfish and western carp gudgeon at temperatures higher than optimum for the species and in the presence of endosulfan, chlorpyrifos and phenol − all of which wash into waterways from the land. Results varied according to pollutant, species and temperature, but, overall, all three chemicals became increasingly toxic as water temperatures rose. On the coast of Mangalore in southwest India, where mussel farming has become a growing industry, researchers decided to test future toxicity conditions for the green mussel. The Society of Experimental Biology meeting in Prague learned that the bivalves were raised in high temperature and low salt conditions and exposed to toxic algae and bacteria of the kind that might be expected in a changing climate, which in turn affected the timing of the monsoon in ways that could lower seawater salinity. “This is likely to increase the chance of outbreaks of toxic plankton blooms and make farming bivalves such as mussels increasingly challenging,” the meeting was told. But changes to water chemistry — once again, the shift in pH values as yet more carbonic acid builds up in the seas — create problems enough for the commercial shellfisheries. Wiley Evans, research associate at the Ocean Acidification Research Centre of the University of Alaska Fairbanks, and colleagues report in the Public Library of Science journal PLOS One that shellfish farmers off the Alaska coast might, at extra expense, have to start modifying the sea water in their hatcheries because, the researchers reported, they expect “significant effects” from acidification by 2040. Research has repeatedly found that increasingly corrosive waters make it more difficult for shellfish to exploit the calcium carbonate minerals needed to make shells. The scientists monitored for 10 months the effects of water chemistry changes on oyster, clam, scallop and other shellfish larvae. Alaska — with a limited growing season, melting glaciers that affect salinity and with colder waters that more readily dissolve carbon dioxide — is a special case. But in general, as researchers have repeatedly found, increasingly corrosive waters would make it more difficult for shellfish to exploit the calcium carbonate minerals needed to make shells. Shellfish spend their maturity in one spot, whereas fish can and do shift their grounds when the conditions become uncomfortable — with consequences for established commercial catches such as sardines and sea bass. But a 5°C average warming in global atmospheric temperatures — and climate scientists have repeatedly warned that this is possible before 2100 — means that fish are likely to migrate away from their existing habitats considerably faster than they are doing now. Jean-Pierre Gattuso, of the Oceanological Observatory in Villefranche, France, and colleagues looked at the evidence on a global scale and report in Science journal that, without attempts to mitigate global warming, the oceans and the creatures in them will be seriously affected by temperature changes and acidification. This is very bad news for the millions of people in the communities that depend on the seas for a living. “On a positive note, we still have options to substantially reduce these impacts now, but the longer we wait the fewer and fewer options we have,” warns co-author William Cheung, of the fisheries centre at Canada’s University of British Columbia. Acidic Oceans and the Coming Trouble with Fish/span> by Tim Radford/Climate News Network is licensed under a Creative Commons Attribution 4.0 International License.